Before buying and hooking up a dishwasher, you’ll need to measure your space to make sure it will fit. Most dishwasher standard sizes are 24 inches wide and 34 inches high. 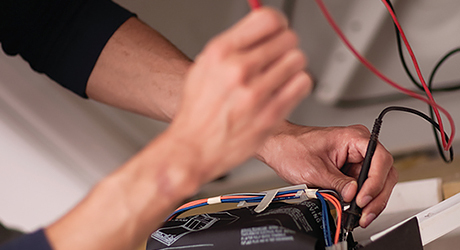 This guide explains the steps required for dishwasher connection and installation, including electrical and plumbing requirements. Keep reading to learn how to install a dishwasher. 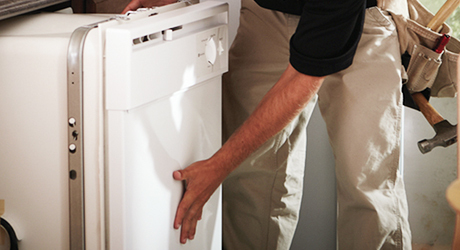 Tip: Some units come with a dishwasher install kit that can be used to make the process easier. Review the manufacturer’s instructions for specific information on how to use the kit. When installing a dishwasher, first read the manufacturer’s instructions for the location of the power supply and drainage lines. Remove the bottom access panel to find the power cord connection, inlet solenoid valve and drain outlet. Measure and mark the location to cut a 1 ½-inch hole in the wall of the cabinet. Slide the dishwasher into place and verify the location. Slide the dishwasher out and set aside to make room for more work beneath the cabinet. Cut a hole in the cabinet wall with a power drill and hole saw. Run the drain tubing, supply line and power cord. Slide the dishwasher into place and level by adjusting the threaded feet. Tighten the locknuts on the feet. Install the compression elbow on the dishwasher solenoid. Bend the supply line so it lines up with the elbow. Slide the compression nut over the tubing and then place the compression ring over the end. Connect the tubing to the solenoid using an adjustable wrench. Install a tee on the hot water supply. Measure and cut tubing to the tee. 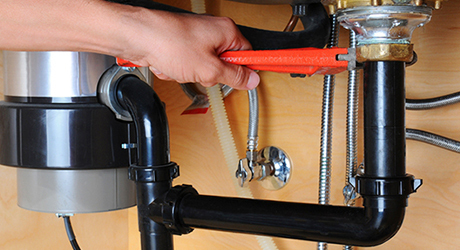 Turn on the water supply, inspect for leaks and tighten the connections. Replace the regular sink drain tailpiece with one that has a side inlet. 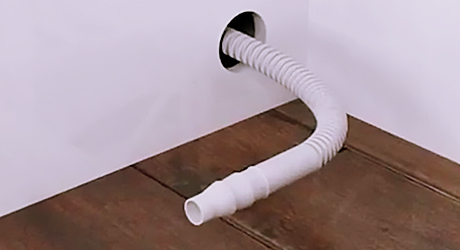 Connect the drain line to the dishwasher outlet using the hose clamps. Measure the hose and cut it to length so it connects to the inlet with another hose clamp. 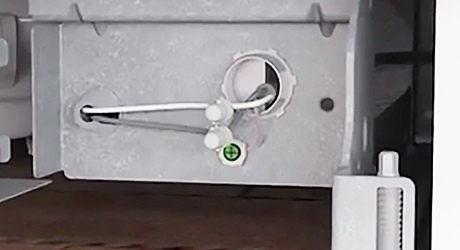 To complete your dishwasher install, match the wires by connecting white to white, black to black, and green to the ground screw. If the colors differ, read the manufacturer’s instructions for connecting the wires. Connect the wires with wire nuts. Plug the supply cord into an electrical outlet installed under the sink cabinet. Now that you've learned how to install a dishwasher, you may be interested in hiring a professional. For information on the cost of installing a dishwasher through The Home Depot, please see our Appliance Delivery and Installation Services page.